The Organic Centre is a non-profit organisation set up in 1995, with the aim of providing public education, training and information about organic growing and sustainable living. The Centre is located on a 19 acre site in Rossinver, Co Leitrim, Ireland, with outreach centres also in Co. Clare and Co. Wicklow. An eco-shop selling garden tools, books, seasonal vegetables, etc. 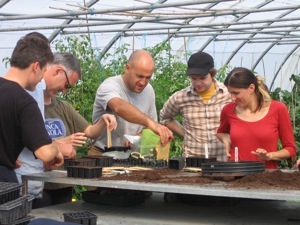 The Organic Centre enjoy the support of a wide network of friends. Their Friends Membership Scheme offers a range of benefits including free entry to our gardens and open days, gardening advice, and discount on shop & seed sales, and training courses. You can also donate or purchase gift vouchers for our centre.